Old girl, Karen Raubenheimer presents some of her PhD research at the UN headquarters in New York. 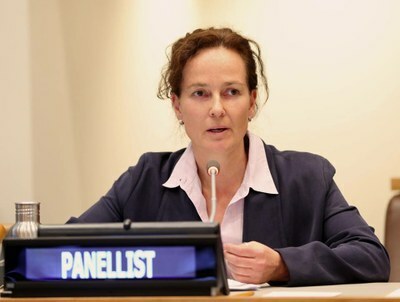 SIMS researcher, Karen Raubenheimer (Matric 1987), recently participated in the 17th United Nations Open-ended Informal Consultative Process on Oceans and the Law of the Sea, held at the UN headquarters in New York. The topic this year was 'Marine debris, plastics and micro-plastics', and Karen presented some of her PhD research, discussing the feasibility of a new binding international agreement to prevent marine plastic debris from land-based sources.